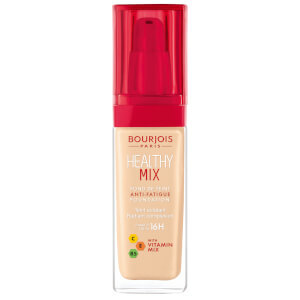 Create a radiant and dewy base with Bourjois Healthy Mix Serum Foundation, an innovative liquid gel foundation that glides effortlessly onto skin with natural-looking, lightweight coverage. 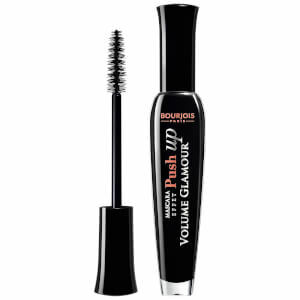 The gel texture blends instantly into skin, delivering an even and natural-looking finish without any mask-like effect. Diminishing the appearance of imperfections and erasing signs of fatigue, the liquid foundation provides a radiant and perfected skin finish for up to 16 hours and delivers serum action to enhance skin's beauty day after day. Its vitamin-rich Fruit Therapy of Litchi, Pomegranate and Goji extracts work to revive the look of skin to promote a healthy-looking, glowing complexion. Suitable for all skin types, even combination skin. 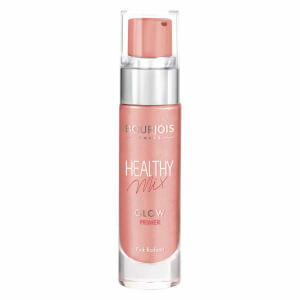 This is really nice foundation.It is not cakey and lightweight.